BRG International’s newly released transaction data for the second quarter of the South Florida residential market provides analysis for Miami Beach, Sunny Isles Beach, Bay Harbor Islands, Bal Harbour, and Surfside. Average sales price increased overall in both the North and Mid Beach neighborhoods with sharp rises in the days on the market throughout the Miami-Dade County. Bal Harbour condos outperformed all markets with the average price per sf increasing to $817, up 8.8% since last year, followed by South Beach's average of $724 per square foot. Only single family homes reported mult-million dollar median sales and average sales prices for both quarters year to year, where the sales price average $5,991,111 a -5.1% decrease from 2015. The sharpest sales decline for condos at -24.4% is represented in Bay Harbor, where the average price per square foot is $260. Surfside condos in the mid-beach area showed the highest sales difference jump from 2015 to 2016 at 24.1% compared to 5.8% in Bal Harbour, and 11.4% in Sunny Isles Beach. 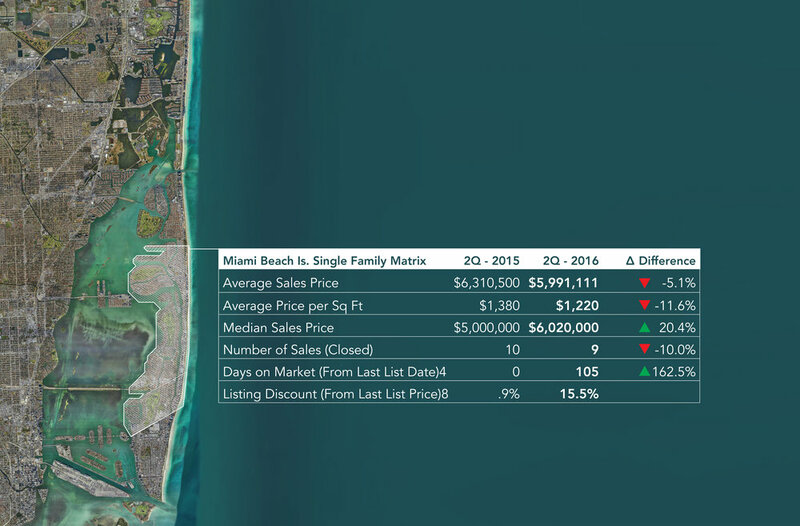 Miami Beach single-family homes showed slight declines in sales price average this year at 5.1% selling at an average of $1,220 per square foot but continues to report competitive multi-millon dollar average and median sales prices. The number of closed sales continues to fall as condo marketing time doubled in upmarket areas. South Beach had the highest number of condos sold in the Q2 with 278 closed sales, followed by Sunny Isles Beach at 130 in 2016. All areas saw double-digit declines in sales with Sunny Isles and Bay Harbour taking the lowest drops at 36.6% and 26.7%, respectively. Listing discounts for single-family homes increased by 15.5% as the number of closed sales fell 10% this year. Increased negotiability and expanding marketing time is represented in every area during the second quarter 2016. Sales discounts were the lowest in Surfside and Bay Harbour each reporting a 5.2% discount compared to the highest listing discounts offered in Sunny Isles and South Beach at 8.4% each. The average days on the market for condos and home has doubled or tripled in range between 3 to 4 months. Miami Beach single-family homes demonstrated a 162% jump from 2015 to 2016, spending an average of 105 days on the market. Luxury condos in South Beach spent 102 days on the market up 85.5% since 2015, while Bay Harbour condos spent the longest time at 123 days.